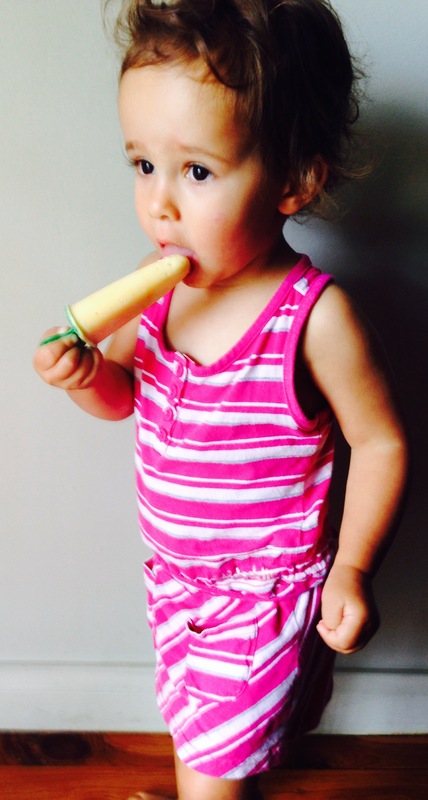 Below are some super easy Popsicle recipes to get you and the kids through summer. I must admit they are my healthy treat at the end of the day when I’m craving something sweet. You can use any type of yoghurt, reduce fat or flavoured. I tend to have jalna organic natural or bush honey in my fridge. Also leftover mixture is really just a smoothy. Enjoy! 11/2 cups (420g) of yoghurt. Now I use Jalna’s organic yogurt with bush honey. You can use anything from vanilla to natural. 1 mango. I scrap out all the flesh from the cheeks and around and off the seed. 1/4 cup (60ml) of light agave syrup. Place into a blender and blend until smooth. Let the mixture sit for a few minutes to get the bubbles out. Pour into Popsicle moulds and freeze until solid. Whisk together the yoghurt and Jam. Stir through the sliced strawberries. Happy New Year! Wow. 2013 was quite challenging (more like First World problems challenging) – nothing in comparison to what I am sure millions of parents around the globe have to deal with every day when it comes to raising their children. I am feeling very lucky these days, too many bad news stories from hanging out with my friends that work for DOCS. We are still very blessed with our healthy little girl Rafaela, She will be two in 8 days! She has an amazing little personality these days. I have to say the most adorable thing is seeing her wiggle her bum when she is free of her nappy before her bath. It washes away the countless tantrums and leg clinging episodes we battle with throughout the day. Oh the joy! What I do love about her age now is she can help me cook. She is so excited stirring and pounding pizza dough. I hope we can keep up the enthusiasm. 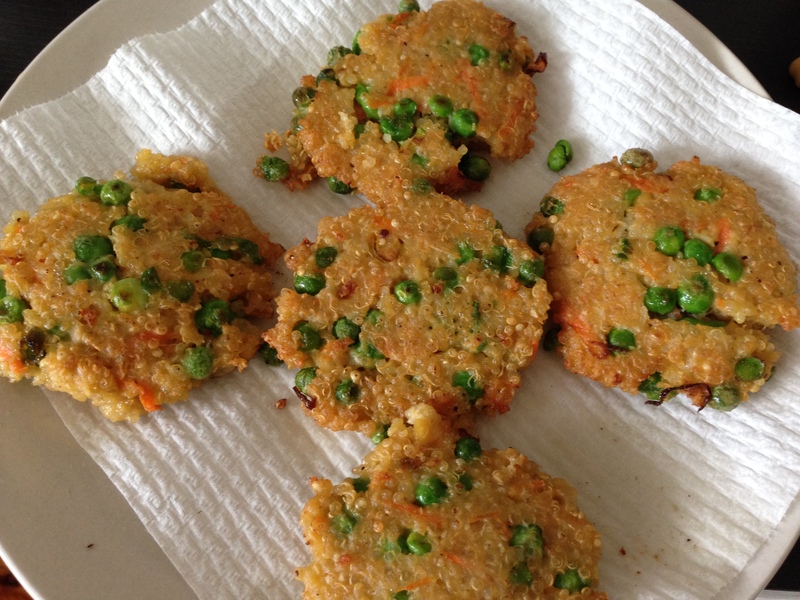 Today she helped me make the fritters below and all she could say was “Oh wow” and “Yummy in my tummy”. Then she gobbled down three of them for dinner. I’m not quite sure that she understood, that what she was eating was what she helped me make. Regardless, she was eating a dinner littered with green, which was amazing enough. I’m back at work full-time now, therefore the opportunity to really consider our meals has been limited and hence the lack of posts. Though the recent festive season (I hosted our family Christmas dinner) really ignited my love for menu planning, cooking and inventing! I’ve enjoyed an extra week off at work and armed with a few new cookbooks for Christmas, it’s game on! As with the start of every New Year, I try to turn over a ‘new leaf’ in my eating habits and inflict these on to the hubby. This usually consists of weird grains and vegetables. He hates peas and isn’t really a fan of quinoa. We started off using quinoa instead of breadcrumbs on schnitzels. It was merely quinoa (cooked in vegetable stock) seasoned with salt, pepper and some sage on the chicken. Add a squeeze of lemon before serving with mash and greens. They worked out fantastic but didn’t photograph well. It was a really great way to pack in some extra protein, fibre and iron. With a great deal of left over quinoa, I started to look for different ways to use it and adapted this Donna Hay recipe. As I said, Rafaela hoovered these down, which makes me so happy! Andrew also went back for more… did I mention he hates peas! We both agreed that they tasted like Chinese fried rice. Random indeed! Sea Salt and Cracked Pepper for seasoning. Roughly mash the peas and blend the chickpeas in a food processor. Place into a bowl with the quinoa, eggs, rice flour, oil, carrot, cumin and season with Salt & Pepper. Mix well to combine and sit aside. Line a baking tray with non –stick baking paper and start to form ¼ cupful’s of the mixture in to thin patties. Lay the patties on the tray to set before shallow frying. Heat the extra oil in a non-stick frypan over medium heat and cook, in batches, for 3-4minutes each side until golden. Drain on absorbent paper. The fritters can be served warm or cold. Rafaela cooking up a storm! It has been awhile, I must say. What has happen since then and now, well Rafaela is growing up fast. She is 21 months old. I’m looking forward to when I can say she is 2 years and then we just go up by halves right? Imagined if we referred to our ages in months, I would be 380 months old! We definitely are in full swing of the infamous ‘Terrible Twos’ she loves to throw the most outrageous tantrums and the attitude is phenomenal. She has the ‘Terrorist’ as her nickname. However on the flip side she is so incredibly smart and funny. Her personality is shining through these days, even if it can be more challenging. 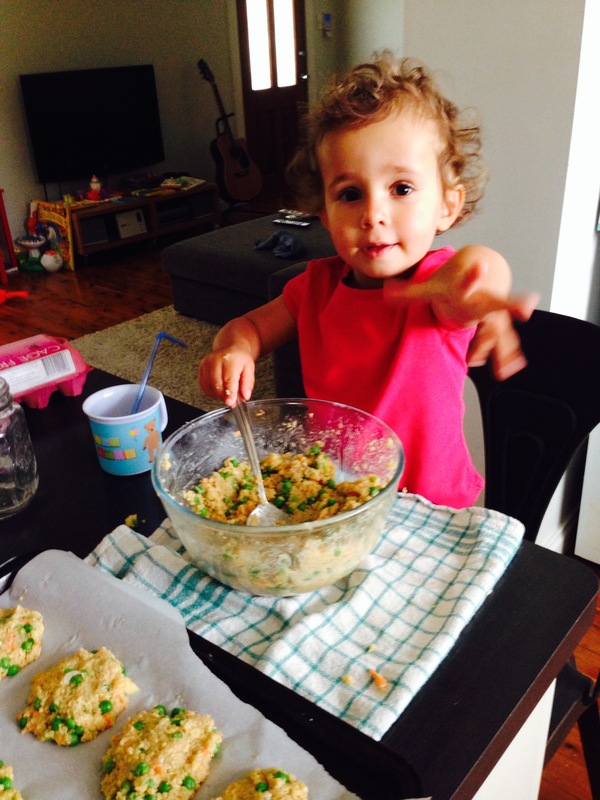 She loves to repeat what we say and do, so eating now is getting to be a tad less of challenge as she wants to eat more and more by herself… Now from what I gather about most kids, green needs to be unseen so hiding vegetables has become my new pass time. Hence the Meatloaf! It’s a great way to use mincemeat and also hide vegetables. I’ve adapted this recipe from Donna Hay. She had these so nicely wrapped individually… Sorry I couldn’t quite pull that one off with the little one. So I’ve gone all traditional and used a loaf pan and a stack of additional vegies. The couscous gives the loaf a really nice texture and actually holds the loaf together quite well. The bacon naturally adds a nice smoky flavour and keeps the whole dish moist. To freeze, merely slice and place between non-stick baking papers in a freezer proof container. 2 rashers of bacon, extra, chopped. Preheat oven to 180 degrees (350 F). Heat the oil in a non-stick frying pan over medium heat. Add the onion and garlic and cook for 5-7 minutes or until softened. Allow to cool completely. Line a loaf tin with the rashers of bacon, slightly overlapping. Place on a baking tray and set aside. Place the couscous in a bowl with the onion mixture, oregano, lemon rind, mustard, eggs, mince, extra bacon, Salt & pepper and mix to combine. 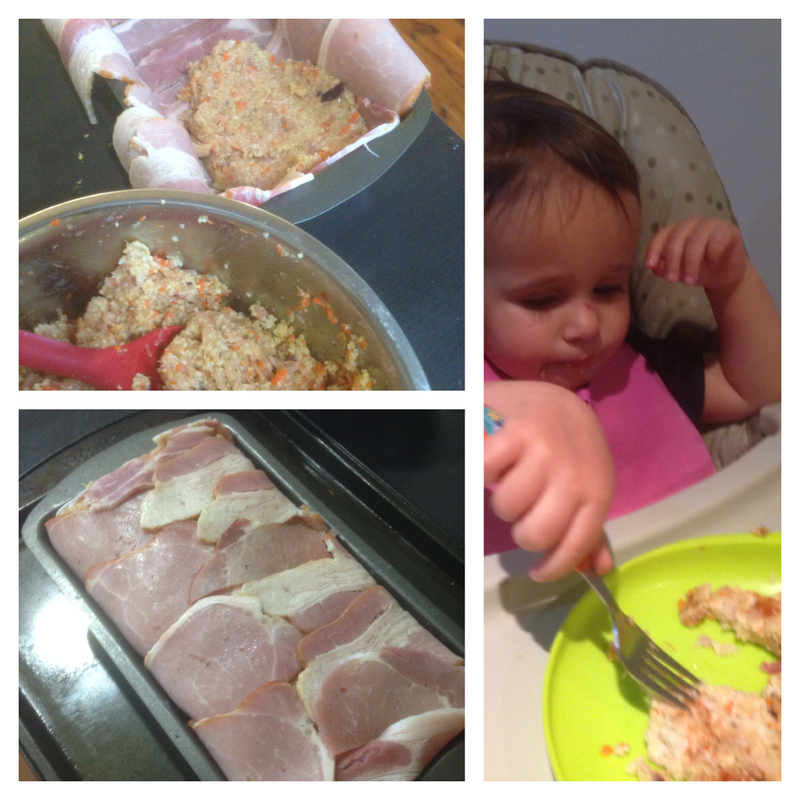 Place mixture into the loaf tin, packing it in tight and then fold over the bacon. Bake for 25-30 minutes or until cooked through. Increase temperature to 220 degrees (440 F). Set aside for 5 minutes before inverting onto the baking tray, lined with non-stick baking paper. Bake for a further 5-10 minutes or until golden. Serve with tomato chutney or sauce if desired. Makes 6-8 slices. Top left: Packing in the filling. Bottom left: Snug as a bug in bacon rug, Right: Rafaela chowing down. What glorious weather we’ve been having lately. Rafaela is taking full advantage of it too. She is much more nimble on her feet and one of her favourite words is ‘Outside’. The great thing is that she knows she has to have her shoes and hat on before she can go out there which is a great little habit! When the weather is great we try and spend as much time outside getting some much needed vitamin D. So we have been considering what makes a good ‘movable feast’. We had a somewhat impromptu picnic today with the family and we made crispy tofu rice paper rolls. Really straightforward… but not quite bubbachoo friendly right now, but great for your bigger kids! 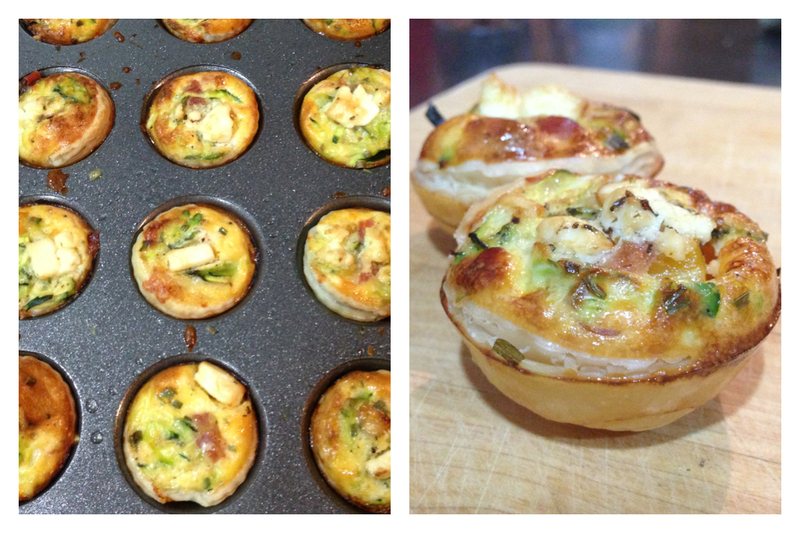 Another great ‘movable feast’ item is the mini quiche. It’s also a great way to use up leftovers and hide vegetables, which is my new task. Therefore this recipe is totally interchangeable with a number of tasty combinations. Think ham & cheese, mushroom, spinach & fetta, corn etc. Rafaela seems to have regained her true ‘Hunter’ appetite. She is currently well (aside from a weird rash). No congestion and no teething. Outside of just eating pasta she hasn’t been very adventurous, though she is starting to show a need for independence and eating by herself. She has the coordination down pat, just can’t work out how to get the food on the fork or spoon, I’m sure we will have some kind of stabbing cutlery injury any day now. ½ Butternut Pumpkin, peeled & cubed. Fresh or dried Chives, finely chopped. Pre-heat oven to 180 degrees, toss the cubed pumpkin with a little splash of olive oil and salt & pepper. Spread the pumpkin on to a tray lined with non-stick baking paper and roast in the oven for 20-25min until cooked, remove from the oven and cool. Prepare the cupcake tray with a light brushing of olive oil. Defrost the puff pastry and cut out enough rounds to line the holes of the tray. They do not need to line the entire cup. If you want to be a bit more health conscious or frugal with the pastry then you need just enough to make a little cup. Fill up the pastry cups with pumpkin (2-3 cubes per cup), zucchini, cheese and chives. At this stage you can add any additional ingredients (Little ham or bacon is nice) evenly fill each cup with enough egg mixture to cover the pastry or to just the lip of the pastry. Place the trap into a 180 degree preheated oven and cook for 25-30min until the pastry is golden and puffed and the filling is firm. To freeze, make sure that they are completely cooled first. To reheat, wrap them in foil and place back into the oven. Adjust timing based on thawed or frozen. Turkey mince is so affordable; I remembered how I raved about it over the festive season when Turkey was on my mind. It’s the ‘other less fatty white meat’ I also have the quote Seinfeld when I think Turkey… ‘It makes you sleepy’ great for kid’s right! It is the amino acid tryptophan that research suggests in large amounts can make you sleepy. It also produces serotonin that helps strengthen the immune system. Regardless, it was half the price of Chicken mince and we haven’t had that much luck with chicken lately. I found a great recipe from a kitchen queen – Nigella, which I adapted purely because I never have celery in the fridge, I always have carrots! Much like patties, burgers rissoles; meatballs can be a combination of anything with a few binders. The trick is to not over work the mixture as it can make them too dense. You can serve these meatballs with pasta, mash potato, polenta, couscous, steamed vegies or salad. You can even serve them as finger foods for your next dinner party, because we all have time for that! Puree the onion, celery and carrot in a food processor. Reserve ¼ of the puree in a bowl for the meatballs. Heat oil in a large skillet over medium heat. Reduce the heat to low and add vegetable puree and thyme, and cook for about 5 -10min. Add tomatoes, water, sugar, salt & pepper. Bring to a gentle boil then reduce to a simmer and let cook while prepping the meatballs. Add all meatball ingredients to reserved vegetable puree. 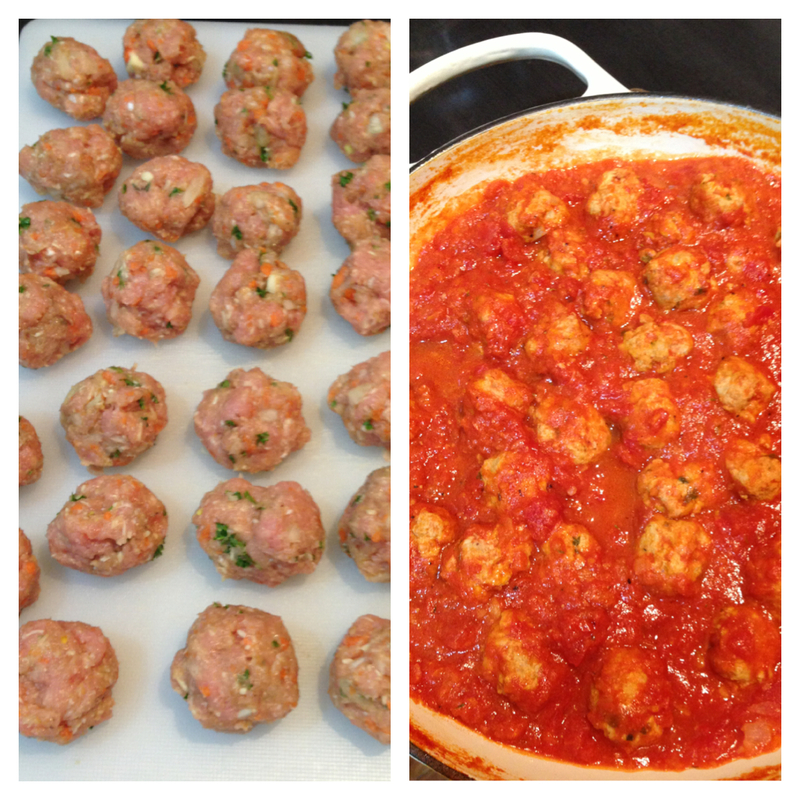 Mix gently to combine; avoid over mixing to prevent the meatballs from being leaden and heavy. Form mixture into about 50 meatballs, about the size of a heaped teaspoon. Once all the meatballs are formed, add them to the simmering sauce (Pushing them down to have a light covering of sauce) Continue to simmer 30 minutes, or until the meatballs are cooked through. Turkey Meatballs in Tomato Sauce. 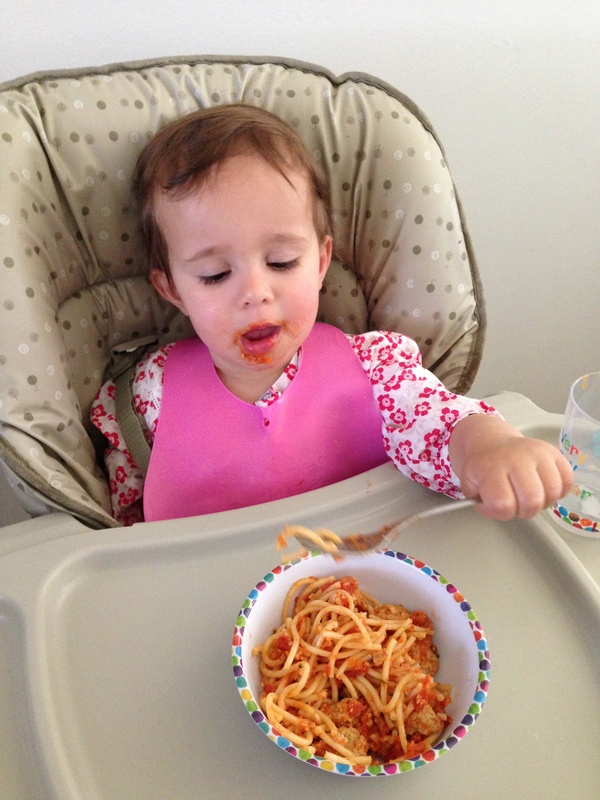 Rafaela eating her meatballs. Gobble Gobble. This tart was an experiment of combining two recipes and it worked a treat! It all came about after dedicating precious hours, during Rafaela’s nap, to clean the pantry out. Prior to this I had found a trail of ants marching their way in and was baffled as to what they were after. A few months earlier, we had the same scenario and I realised they were all over the jar of honey! So after pulling it apart and reorganising (also a very timely exercise since returning from Costco), I found too many half full bags of pastas, rice, noodles and polenta. I thought it wise to start fresh and finish them all off. In addition to this, the hubby had returned home with a bag of silverbeet earlier in the week. He actually thought it was spinach and for a long time so did I. So what is the difference? Well sliverbeet is from the chard family, closely linked to beetroot. They have bigger stiffer leaves with white stalks and it needs to be cooked before eaten. This is due to the high level of Oxylic Acid. Spinach on the other hand has small, soft leaves and can be eaten raw in salads. Both are great sources of Iron and Folate. Depending on the recipe it can be pretty interchangeable; therefore a spinach pie or tart can easily use both. It is just this scenario that inspired me to develop this blog. I would find all these various ingredients and just Google them in one sentence and see what comes up. I also reach for Stephanie Alexander’s ‘The Cook’s Companion’ to filter an expansive list of ingredients. 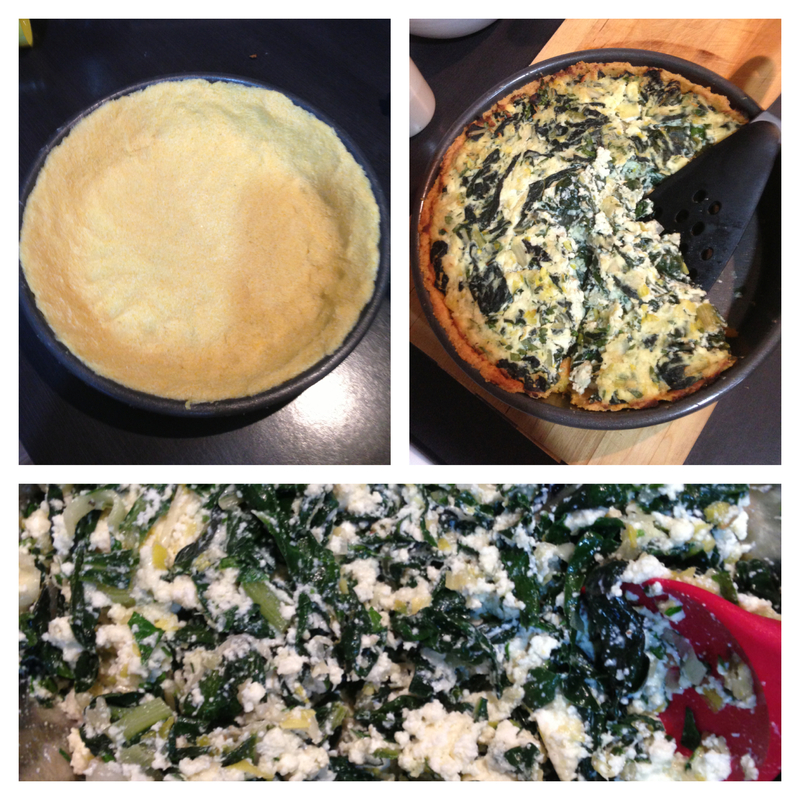 I found a polenta crust from Donna Hay and a spinach & ricotta pie from Teresa Cutler’s ‘Healthy Chef’ blog. Added some lemon, garlic and parmesan (yep the freezer is pretty similar to the pantry at the moment, too many half full bags of cheese!) and we had a pretty tasty dish for the family. I really liked the polenta crust, it was a great way to use the grain and it added a cheese like depth of flavour to the dish. I served the tart with a tomato and balsamic vinegar salad. It felt very light and fresh and best of all, Raff gobbled it down! Preheat the oven to 180 degrees. To polenta crust, place the flour, polenta, butter, water and salt in the food processor and process until a dough forms. Press the dough into 24cm loose bottom tart pan (or grease a round cake pan). Top the dough with non-stick baking paper and fill with baking weights or dried beans. Bake for 15 minutes, remove the paper and weights or beans and bake for another 10 minutes or until crisp. To make the filling, sauté the leek and garlic in a pan with a splash of olive oil until soft. Add the spinach or silver beet to pan and season with salt & pepper, nutmeg and basil. Cook until wilted, remove for the heat and drain any excess liquid. Add the ricotta, lemon, parmesan and mix through until combined. Spoon the filling into the pastry lined pie shell and bake for 35-40 minutes in preheated oven at 180 degrees until golden. Do you need a super cheap and super easy meal that everyone will love? 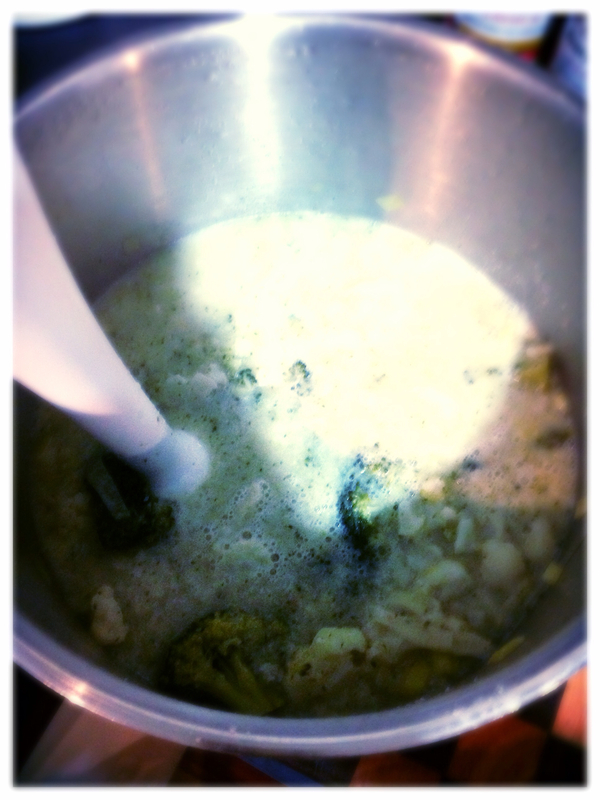 Try making a Cauliflower & Leek Soup aka CC Soup (Cheap & Cheerful). I found this recipe from Teresa Cutter, the healthy chef (my new bible) My mother dropped over a huge head of cauliflower, which sent my fingers to do the typing, on the hunt for a recipe that would somewhat disguise the vegetable from Rafaela. (It’s not cheap because I got the cauliflower for free…) It’s cheap because it is cauliflower season and cheerful because all you need is a leek (also in season) and 4 cups of stock or water. It is the ultimate one pot meal; all you need is a hand blender to make it thick and smooth. In addition to these benefits, Cauliflower is rich in sulphur which works as an anti-inflammatory, support digestion and boost your immune system. Everything Rafaela needs at the moment! Now we’ve made this soup a couple of times now and I thought I’d taken photos of the creation, but it must have been gobbled up before I could snap it! I was really surprised at how much Rafaela really enjoyed it and so did the hubby! 3 – 4 cups (750 – 1000 ml) water or organic vegetable or chicken stock. Slice the cauliflower finely into small bits. Sauté the leek in 2 tablespoons olive oil over a medium heat for 3 minutes until softened. Add the cauliflower and 3 cups of water or stock plus a little sea salt and pepper. Cover + cook for 5 – 10 minutes until the cauliflower is tender and then remove from the heat. Puree in the pot with either a hand blender (careful of hot splashes) or place into a blender with 1 to 2 more cups of water or stock, depending on the consistency you like. Serve warm soup with your choice of grated Parmesan or cheddar. Combine parsley, oil and salt into a blender and process until smooth. Pour into a fine sieve and strain the oil from the solids. Drizzle over cauliflower soup just before eating. It has been a while since I’ve posted any recipes, I must say the cold weather has taken its toll on the family. We’ve had a little sick monkey on our hands, well I am going to say it has been on and off for the last 6 months and it has just been exacerbated by the cold weather. I am sure every parent goes through this battle, months of runny noses, ear infections and chesty coughs. I think the hardest thing is she can’t blow her nose. I think it would solve a great deal of her problems! She likes to make the noise and pull out tissues from the box and hold them to her nose which is all very cute, but isn’t helping! Along with the sickness comes the teething, Poor girl has mini volcanoes all along the back of her mouth waiting to erupt. This all contributes to one upset little girl. Her appetite has definitely suffered, we have reverted back to the puree food so how timely that it’s soup season! This is a great recipe to use up left overs, especially after a roast/BBQ chicken meal. You can make this with home-made stock or pre-made stock, just look for options that are organic and low in sodium (Salt). We have a cheeky weekend ritual; well it pretty much started when Andrew started renovating the house. We enlisted the help of many capable friends and family to help with a bit of coaxing – Lunch and beers. So began the trip to the best little BBQ chicken place in the hood. So if you roast your own chickens of not, this is a great recipe from Donna Hay that uses up the carcass of the Chicken to make a beautiful, clear stock. Cracked pepper and parmesan to serve. Preheat the oven to 200 degrees. Place the chicken bones, onions, carrots, celery in a large baking dish and bake for 1 hour. Transfer to a stock pot or large saucepan with the water, peppercorns, parsley and bay leaves. Bring to the boil and allow to simmer rapidly, uncovered. Reduce the heat so that the stock simmers slowly but constantly. Skim the surface of the stock with a spoon occasionally so that it remains clear. Simmer for 1 ½ hours or until the stock is well flavoured. Add a generous amount of sea salt to bring out the flavour. Strain the stock through a fine sieve. Allow to cool, and then remove any solidified fat from the surface. Refrigerate for up to 3 days or freeze in ready to use portions. This should make 4 litres of Stock. To make the soup, dice carrot, zucchini and any other vegetables such as potato and add to the chicken stock, cooking until tender. Meanwhile, cook the soup mix or pasta according to the packet instructions. Add to the stock along with Shredded chicken and simmer for a few minutes, check for extra seasoning. Before serving, add baby spinach leaves and allow them to wilt. Serve with a sprinkle of parmesan cheese and a little cracked pepper and crusty bread. The content in this eBook has been written by Leanne Cooper, a nutritionist. This content is a summary of the information that is included in Leanne’s book What Do I Feed My Baby. This book was my bible. Highly recommended resource for all new parents embarking on this journey! Wondering what to make for the kids lunch boxes this week? 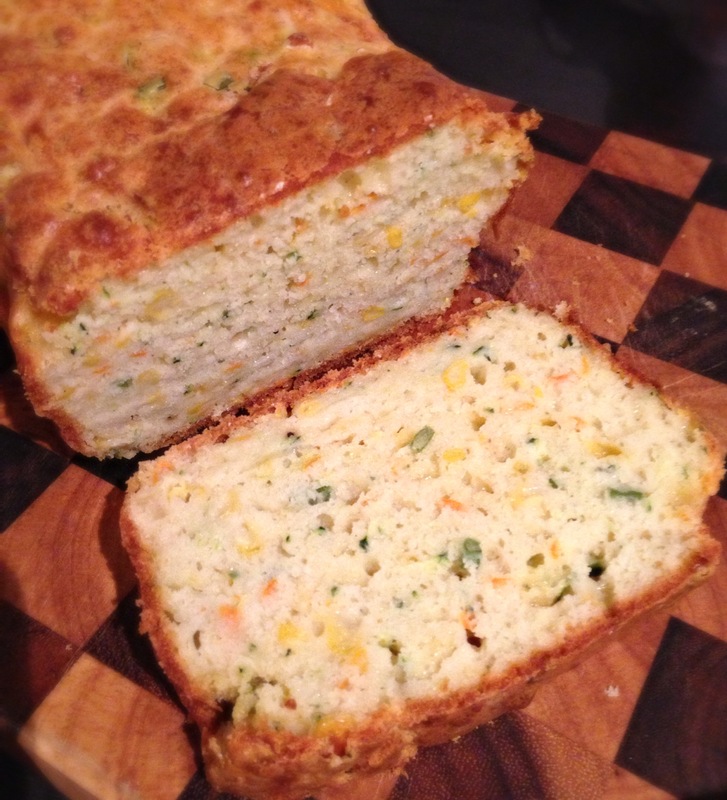 Why not try this Zucchini, corn, carrot and cheddar Loaf? I found this recipe on a recent trip to NZ. I had the chance to go through archived Donna Hay magazine in her IPad App and found this in a old Kids issue.We love a good loaf at home, however they are usually sweet ones. I made this loaf in about 10-15 minutes, this was the time that Rafaela sat down and ate her lunch. So it is very easy and very quick. We have a walking toddler on our hands now, so cooking can be quite acrobatic at the moment and I will say that kitchen looked like a bomb had hit it! The original recipe calls for grated cheddar. I had a mexican cheese medley in the freezer and introduced a lone carrot sitting at the bottom of the vegetable tray. The texture is light and fluffy, yet dense enough to remain in tact if toasting or using as a sandwich. It is best served with some extra sliced cheese and tomato chutney. Cheddar and Tomato Chutney, to serve.